Day one of my vacation in Florida and I wore this comfy denim Dollhouse romper fr @sears and wedges are an old purchase fr @rossdressforless! The sun hat I bought at my local Mall's store Agaci! I bought my kids vacation outfits about a month ago and got $20 Khols cash. Then I got my Khols $5 Reward and a $10 off $30 or more purchase. So, I went this morning to use these Khols coupons and Khols cash and made out like a bandit! Two summer blouses, juicy couture denim shorts & a Lauren Conrad dress and I only paid $6 after all my coupons!!! Then I scored at a local resale store when I got a Black Halo one shoulder romper ($345 value) for only $20!!!! Pictures of my deals coming soon! I had to keep it comfy today while I did some last minute vacation shopping with my four kids!!! That meant wearing flats!!! 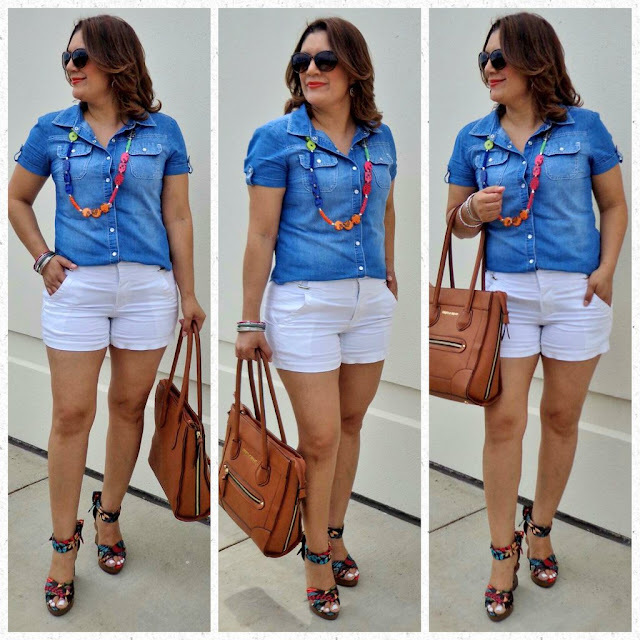 Scoop neck tee (old purchase) @khol's, Jennifer Lopez denim shorts (last summer purchase) @khol's and accessories & shoes fr Cato Fashions on clearance!! I found this little black shirt dress at my local Family Dollar (yes FD) for only $12! Paired with brown wedges I got on clearance at Cato Fashions for only $7.99. My Lauren Conrad accessories are fr the clearance sect @khol's for $4.99! And my tan handbag is a Christian Siriano fr Payless also on sale!!! Total look under $45!!! I love scoring on great clearance deals!!! Keep the black & white for summer! Wear black and white in the summer by adding bold colors like yellow! I added this Nine&Co yellow tote fr @jcpenney and yellow Mix It statement necklace and earrings also fr @jcpenney!! Dress & Carlos Santana pumps are from my local Ross Dress for Less store! 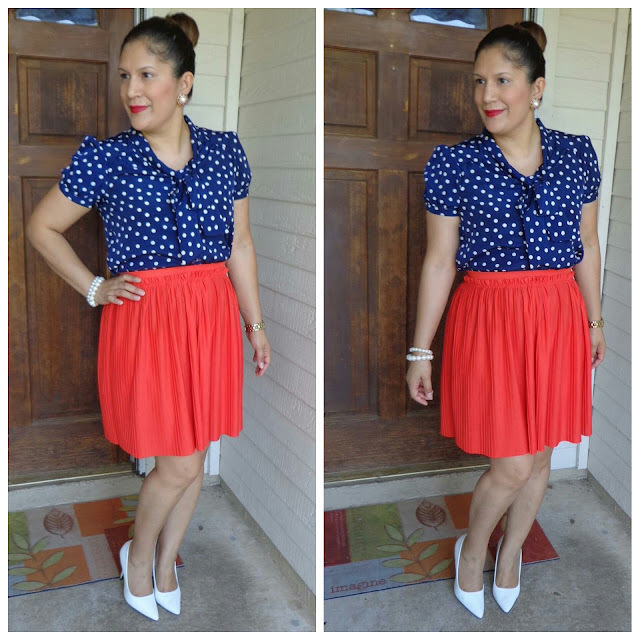 This is a perfect outfit for a July Fourth party, get together, or business lunch party! 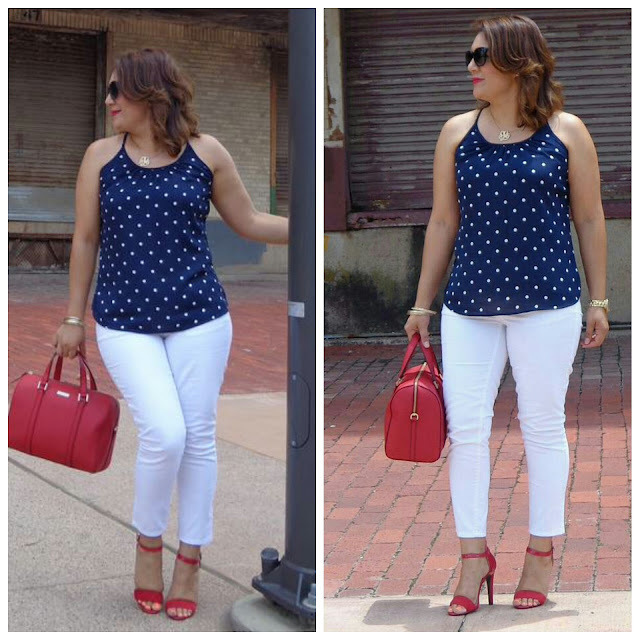 I got the polka dot tank at resale shop Plato's Closet for $3, the white crop capri's on sale last year @khol's and the red heels @rossdressforless! The Kate Spade tote (gift fr my Hubby)!! Gold accessories & you are party ready while wearing red, white, and blue! I couldn't pass up this Covington mustard yellow blazer fr Sears on sale for only $26!!! Paired it with dark denim, black tank and black Comfort pumps also fr Sears! This peplum with the detailed jeweled collar was a handy me down fr my little sister! It's from a mall store called Agaci! 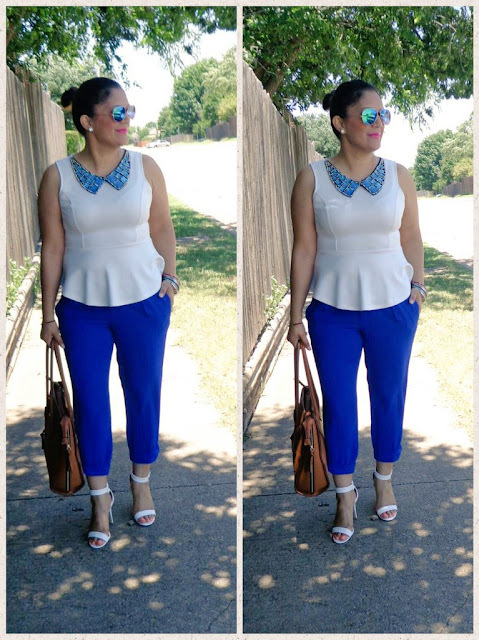 The cobalt ankle pants I got at Cato Fashions on clearance for only $14 and my white strap heel sandals at a mall shoe store called Wink! Paired with my Fav Christian Siriano tan bag & polarized sunglasses(also a clearance deal @catofashions)! I found these white shorts and Bamboo rainforest wedges at Ross! Accessories at Cato Fashions & this Forever21 denim button up at Plato's Closet (I love this resale consignment store)!! My handbag is #christiansiriano fr Payless Shoe Source! I found this romper pantsuit @tjmaxx on clearance for only $10! Added a white belt and nine west pumps fr @rossdressforless! So comfy & chic! Hello all! Hope everyone had a wonderful weekend! Coming to the blog soon, outfit ideas for the FourthofJuly :) Can't wait to show you all my chic, street style, and casual looks! Rock a romper that gives you that street style look! Rock it with pumps, sandals or wedges! 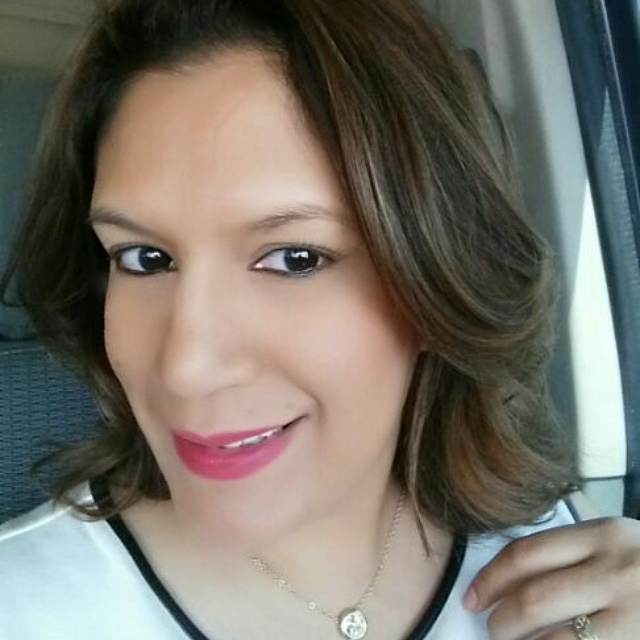 I cut my long hair short just in time for summer & I love how easy short hair styles!